It is a short 92 mile ride from Ogallala in Nebraska where we spent last night to our friends on the northside of Denver so after yesterday’s tough ride, we take it easy and leave our motel at 10 am. We know we need to get to Denver by early afternoon as snow is coming according to all weather reports. As we approach the outskirts of Denver, it is looking interesting out there!! Maybe we should have left earlier… We get rain but no snow by the time we arrive at Karen and Mike’s home and we feel frozen to the bone. 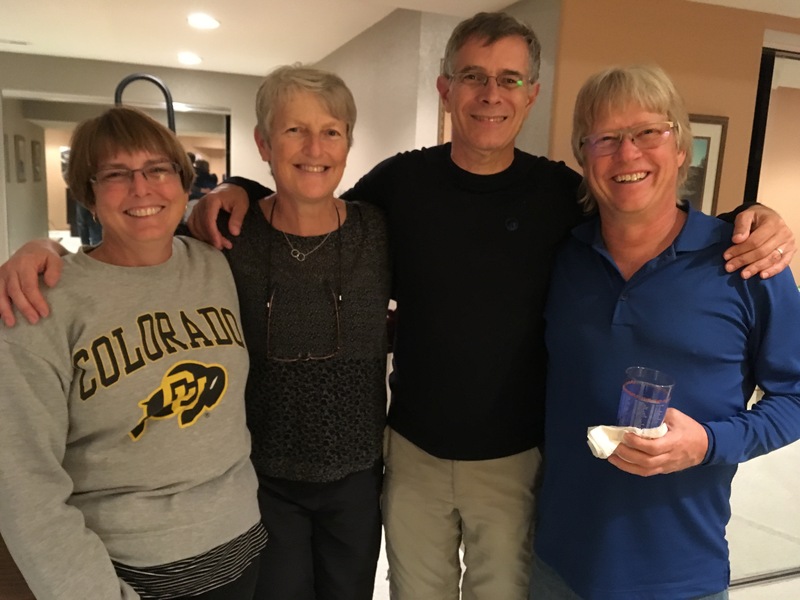 We last saw our friends when we came through on our last round the world trip, so it’s great to see them on this trip. We had planned on spending 2 nights there but snow did arrive as forecast and they kindly invite us to stay 4, until the snow has melted, in Denver at least. We make the most of our time to do some minor bike maintenance (we have been tightening my chain everyday and doubt it will last until Vancouver – we might have to get it changed sooner), use the washing machine (rather than hand wash), buy some emergency rations from REI camping store nearby and generally chat and relax. We tried one packet of the freeze dried breakfast skillet which contains scrambled eggs, potato, capsicum or peppers one morning: it was surpringingly as tasty as I had read in online reviews, so we got 7 more packs. Although this food is light, it is horribly bulky. Perfect excuse to reduce the contents of our panniers and ship stuff back. Sunday evening out with Mike and Karen’s friends Jeff and Leah introduces us to a new game: shuffleboard. 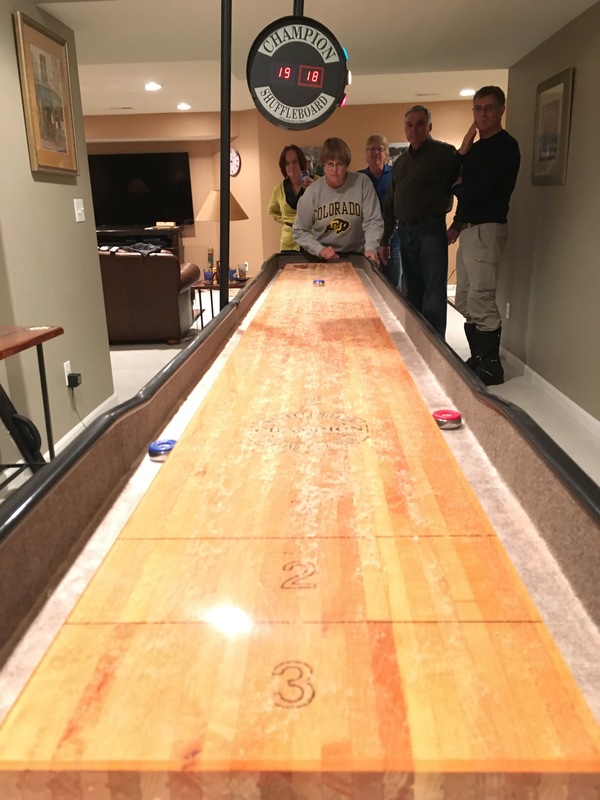 In table shuffleboard, the play area is most commonly a narrow wooden or laminated 22ft, or 6.7m, surface covered with silicone beads (also know as called ‘shuffleboard wax’) to reduce friction. Players propel metal-and-plastic pucks by hand, to come to rest within zones of different values at the other end of the board. It is a variation of the British coin “shove ha’ penny”. The object of the game is to either score or prevent the opponent from scoring by either blocking or hitting their puck off the board. All of us being quite competitive, it is a lively (yes, at times loud) and fun evening. Thank you for your hospitality Karen and Mike. Your turn to come to us next time, or stay at our home if we are on the road! 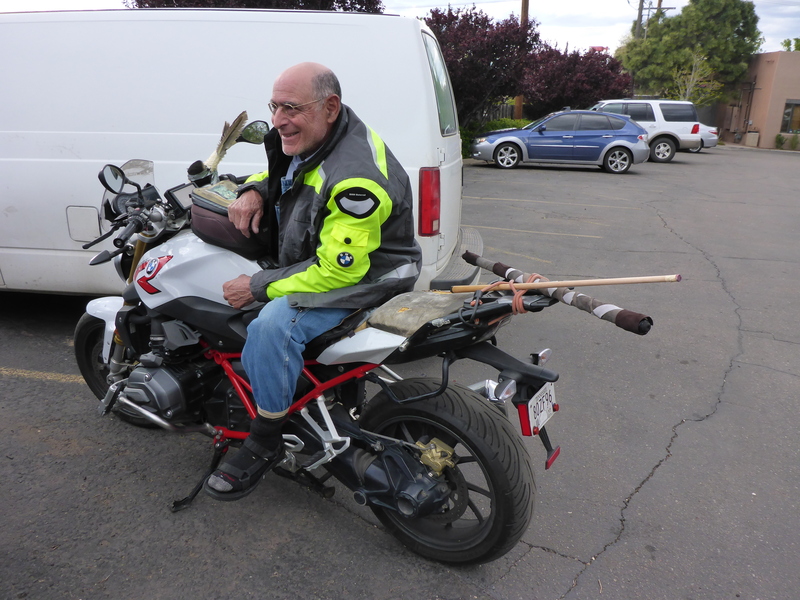 As we get ready to leave, we suddenly make the decision to head to Santa Fe because I made a comment I would like to revisit BMW in Santa Fe as they had been so helpful a couple of years ago with my bike and in fear my chain will not last much longer – we had not fixed our destination until then. 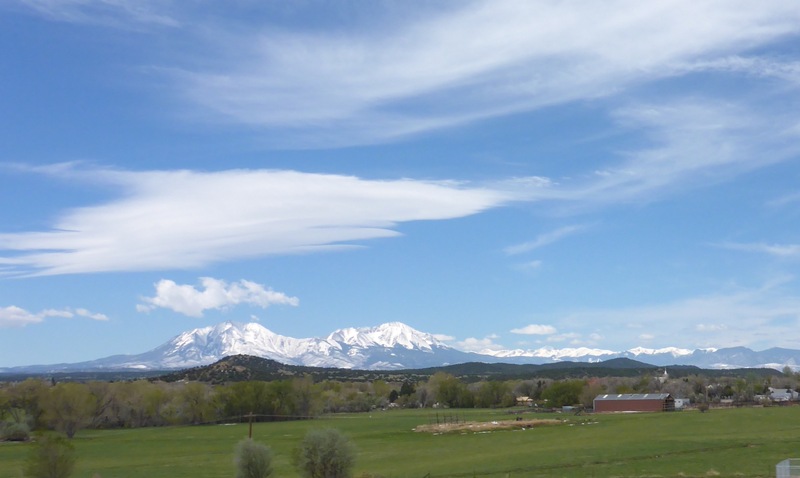 It is a gorgeous day, the sky is deep blue, the air is crisp, the clouds fluffy white and the mountains in the distance snow covered. As we head towards Denver with the Rockies to our right, we comment on how stunning the mountains are, how inviting they look. What a pitty to be missing out on crossing them. Shall we give it a go we ask each other through our bluetooth headsets? Yes, let’s. Quick turn off, detour and we join I70 West. A road we have taken so many times over the past 37 years as we managed to combiness business trips with skiing holidays. As I write this blog and Anthony is watching Star Trek, and I hear: If you always see the road ahead of you, it is not worth the trip – how apt!!! As we approach Idaho Springs, the sky looks really bad ahead so we turn off: a quick check of the weather radar reveals that it is now raining and -2 centigrade ahead. Not a good combination so we turn back! The weather gradually warms up as we head south but with pretty gusty winds. (Read ‘very’ gusty). 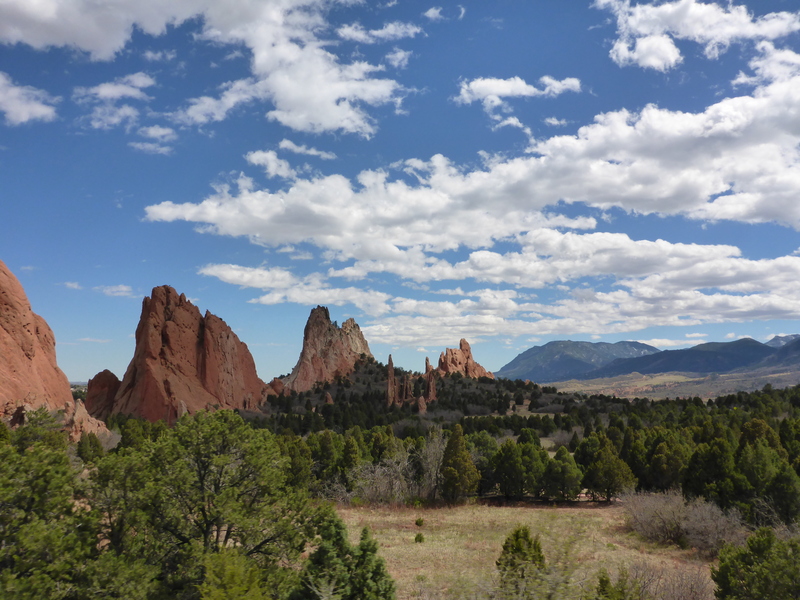 We detour via the Garden of the Gods then stop at Pueblo at 4.30 – we are completely done for the day so find ourselves a motel for the night. We have not travelled far at all today but who cares?! My chain is already very loose though: a quick call to BMW Santa Fe and we order a new chain and sprocket. It will be there the next day – perfect – we now have our route for the next couple of days sorted. 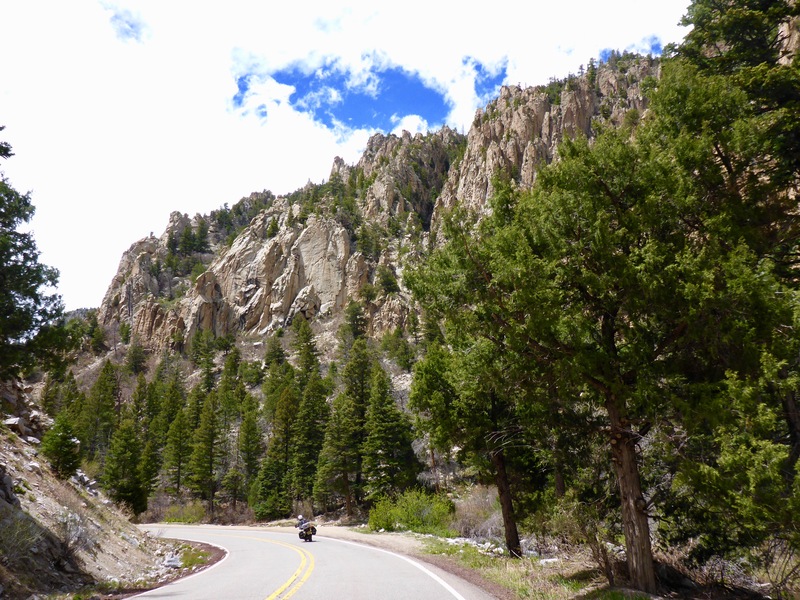 The plan now is to head towards Taos via Eagle Nest on route 64 tomorrow which should be pretty. I am still hopeful we might find a quaint place to camp before we get to Taos, but a quick check of the weather tells me it will be freezing overnight again. 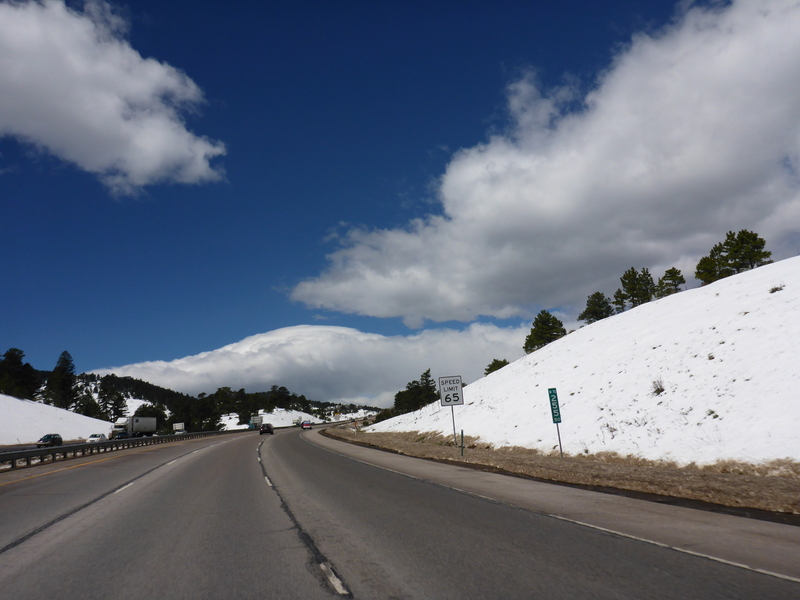 It is amazing to think that a couple of days ago, the I25 road south of Pueblo was closed to all traffic because of a foot of snow. It is all clear now luckily. Shortly south of Ratton we turn off onto the much quieter 64 road which is wonderful but boy is it windy!! My shoulders and neck have barely recovered from yesterday’s winds and now we get some more but the scenery makes up for the discomfort. We have made good time and head into Taos. After riding around the town for a couple of minutes, we realise this is not where we stayed a couple of years ago – no wonder we can’t find the hotel, we are in the wrong place!! We had been thinking of Santa Fe!! Thank goodness for McDonalds in every town: free wifi means we can always check for hotels, vacancies, weather etc. 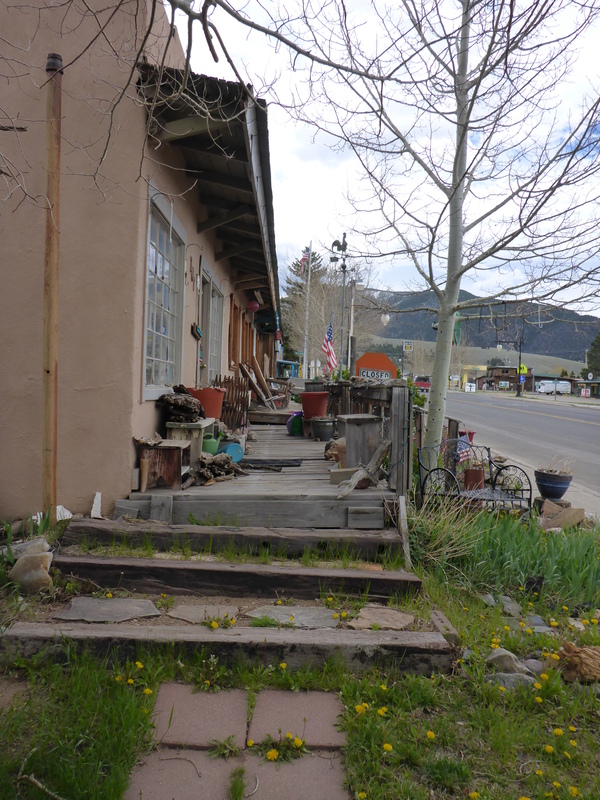 Neither of us is not getting a good vibe from Taos, (we have never seen a McDonald with signs saying washing and brushing teeth in the toilets is prohibited) so we decide to go onto Santa Fe and find ourselves a motel on the outskirts of town. If you are confused about our route, don’t be. As you will have read here, we are making it up as we go along. But for now, we are aiming for warmth and sunshine if possible, with scenery and culture along the way. good move ducking the bad weather, nasty if it is freezing rain! loverly part of the trip and well told. We were tempted but saw reason!! Thanks John. Loving this part of the world. Fun times even with the snow. looks amazing! …..and what a way to celebrate your birthday Ann. I’ll be having a wine for you tonight. Sending all our love to you both. I was planning on sending Birthday Greetings early on the 6th then “things” got in way….have been thinking of you and following your travels. Santa Fe sounds wonderful for a special occasion. You have covered amazing places and distances. All the best.